As always, I like to balance my posts with different feelings, perspectives and the occasional silliness, so this week’s post is a treat into my recent endorphin-inducing activities. Bring on the happy! The picture on the right makes me giggle. If an airplane had to represent a cute, cherub-like baby that laughed giddily for no reason, then I would say the airplane on the right sums up that picture pretty accurately. Hhhmm…too far of a stretch for your imagination? 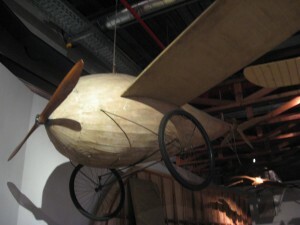 The airplane is part of the collection at the Technikmuseum in Berlin. I wish my siblings could have had the time to see this museum! It is indeed a treat for anyone interested in airplanes, ships, trains and other scientific findings in the field of technology. I wasn’t even able to look through the museum in its entirety. Thank goodness the admission only costs 2.50 Euros for students! I’m definitely going back. I am a complete nerd when it comes to science. Ok, I admit, I don’t exactly understand science particularly well, at least anymore, but after visiting the Museum for Natural Science with my siblings and the other science museum in Wolfsburg, I just couldn’t get off the adrenaline bus headed towards every science-y museum Berlin had to offer. The picture of the airplane above is so unbelievably awesome because that airplane is hanging over the building! 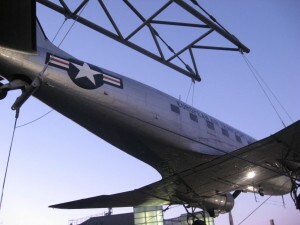 Trust a museum to direct its first-time visitors in the right direction by having an airplane suspended over its building. Ok, I couldn’t resist myself in this picture. 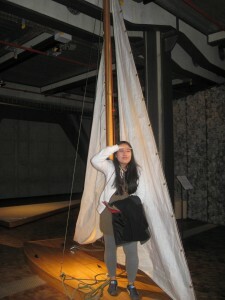 There was an interactive section for children to learn how to tie ship ropes, mess around with a ship’s masts, etc. I took the opportunity to force my friend, K, to take a picture of me pretending to be a pirate and spotting land in the distance. Yeah…I’m 23 and still feel the need to do that. I must post the last picture in this post for you all. It is the most hilarious thing I’ve ever seen at a museum, let alone at a science-related one! I’m not sure why the bottom half of- what I presume is- a man is doing next to this particular part of an aircraft. Any takers? I’m guessing they wanted to show visitors how big or small the model is compared to a grown man? Or…is there possibly no logical reason for this hilarious decision? 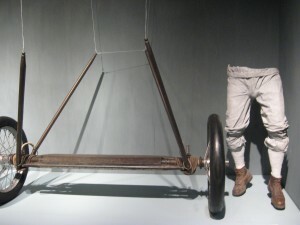 This entry was posted in Jill Nguyen '10, Fulbright to Germany and tagged Technikmuseum. Bookmark the permalink.